Don is back and he's just as systematic, meticulous, and awkward as usual. But The Rosie Effect has a very different vibe to it than The Rosie Project did. 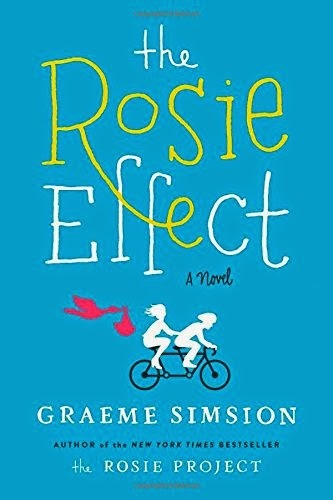 While The Rosie Project was light and humorous, The Rosie Effect is stressful. Don and Rosie have been married for a year when Rosie throws Don a curved ball: She's pregnant! This is an unplanned pregnancy and Don's mind immediately goes into overload trying to compensate for this surprise. Try as he might, he cannot feel emotional attachment to "BUD" or "Baby-Under-Development," as he not-so-affectionately calls it. It doesn't help that his best friend, Gene advises him to observe some children and he gets arrested for doing so. (Apparently, in New York it's illegal to observe children in a public place without accompanying children of your own.) Don's priority is to reduce Rosie's stress level, since increased cortisol is bad for the developing fetus, so he avoids telling Rosie about the arrest. His avoidance doesn't do much to alleviate the reader's own stress, however. The elaborate deception all the way through the book as well as Don barely being able to contain his own stress are why I found it so stressful to read. The resolution occurs in the last three pages of the book and hardly compensates for the reader's suffering. It is difficult to know how to rate this book because it was well-executed. For those who are attached to the characters or Rosie and Don, they will likely appreciate finding out what happened to them after the "Happily-Ever-After." But I felt like the book didn't really shed more light on Don's character. It seemed like he grew more as a character when he was dating Rosie in the first book. In this book, the only thing that really changed was his stress level and his ability to deceive. In some instances, it seemed like the author was stretching to keep details consistent with the first book. For example, he had taken the Edinborough Postnatal Depression Scale test in the first book because it was the only one that his therapist had access to. Did Simsion include this detail because he intended to use it in his second book? Again, well-excuted, but it distracted me instead of bringing me more into the experience of Don as an expectant parent. The only humorous part was when Don talked to his dad about creating the perfect stroller. It becomes clear from this conversation that his dad is even more autistic than he is. The drink I would pair this book is fresh-squeezed orange juice, which is how Don found out Rosie was pregnant when she drank it instead of their regular pinot gris.